PUBLIC TRANSPORT SERVICES have been affected by adverse weather conditions in a number of areas, particularly in the east. A status orange snow-ice warning covering several counties has been extended until 6pm today. The warning is in place for Dublin, Carlow, Kildare, Kilkenny, Laois, Louth, Wexford, Wicklow, Meath and Waterford. Met Éireann has said “occasional heavy snow showers will continue and will lead to further accumulations and some drifting” in affected areas. A status yellow snow-ice warning is in place for the rest of the country. It’ll remain in effect until 9am tomorrow. 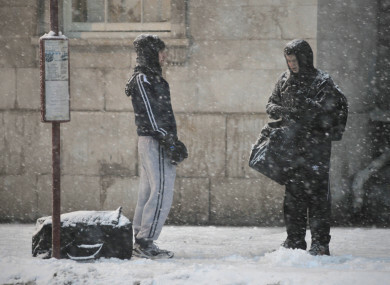 As a result of the snow, a number of Dublin Bus services have been affected “due to the continuous snowfall”. “We will endeavour to operate as many services as possible, however this is dependent on road and weather conditions throughout the day,” the company said in a statement. Dublin Bus is monitoring the situation on an ongoing basis and is taking advice from Met Éireann. The safety of our customers and our employees is of paramount importance. Customers can get the latest information online or by calling 01 8734222. Some Irish Rail services have also been affected. Dart services are only operating between Lansdowne Road and Howth/Malahide due to flooding. Dublin Bus is honouring rail tickets on the affected route. Commuter and Intercity services in and out of Connolly Station are experiencing 30 to 40-minute delays, while services in and out of Heuston Station are experiencing delays of 15 to 25 minutes. The latest updates can be found here. Bus Éireann has said the 132 service has been curtailed as Bunclody in Co Wexford is impassable due to snow. The 109 service cannot operate through Kells in Co Meath due to the bad weather and is being redirected to use the motorway. The latest updates will be posted here. Email “Bus and train services affected as snow hits the country ”. Feedback on “Bus and train services affected as snow hits the country ”.